Standing out as an eccentric sibling to the core family of Super Mario games, the Paper Mario series has spent its brief legacy introducing players to the Mushroom Kingdom in a uniquely quirky, playful, and story-driven way. Often considered the spiritual successor to Super Mario RPG for the SNES, this offshoot franchise has spawned several creative and personality-packed titles. 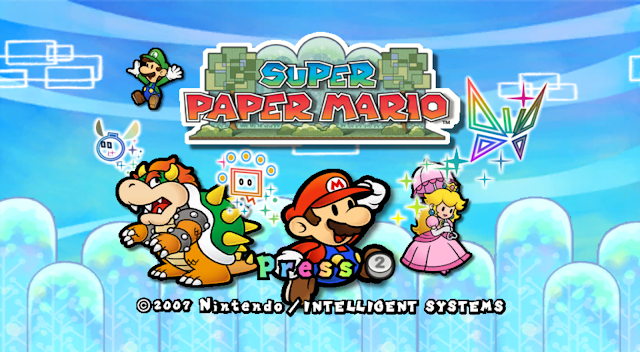 I’d like to, in the future, talk about the first two games for the N64 and GameCube respectively, but today we’re going to explore the world of Super Paper Mario, a Wii title and the third installment in a cult hit series. 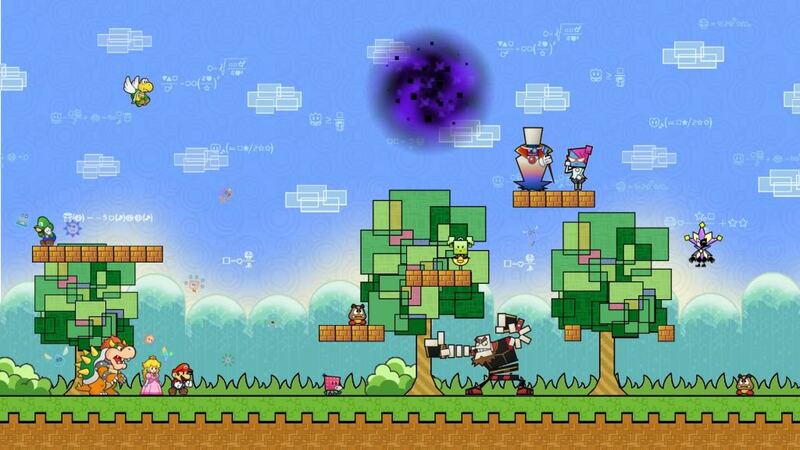 Once again, you play as Mario in all of his flat, cartoony goodness. Also, as per usual, the princess has been kidnapped by some sinister evil, but this time, it isn’t Bowser. In fact, he’s been kidnapped too! The evil Count Bleck is planning to use the marriage of a pure-hearted princess and an evil king to create the Chaos Heart, a mystic relic that is fabled to bring about the destruction of all life. Not the end of the world, all of existence. Right off the bat, our game-specific bad guy is fully embodying the “go big or go home” mentality. The creation of the Chaos Heart was foretold in the Dark Prognosticus, a book of prophecies named for its tendency to make anyone who reads it go insane from learning all of the terrible happenings the future brings. According to legend, the Purity Heart, another magic item created by the Tribe of Ancients to protect the multiverse from the Chaos Heart, could be reassembled if its eight pieces are gathered from where they were hidden over 1,000 years ago. Mario is tasked with venturing to the holding places of each piece of the Purity Heart, defeating the enemies that Count Bleck or other malicious forces have sent to slow his progress, and obtaining the Pure Hearts from whomever was tasked with guarding them up to this point. It’s the usual “collect X number of magic artifacts in order to beat final boss” setup, but with a surprisingly deep, complex storyline beneath the surface, primarily focusing on recurring segments of text-only story that narrate a young couple of star-crossed lovers. 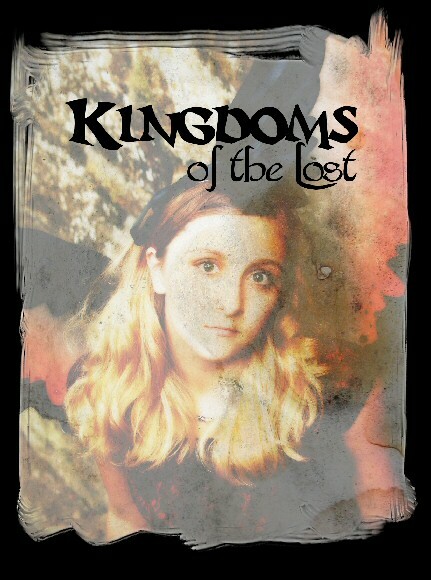 These two characters start to relate more to the main cast as chapters are completed and details are revealed. Unlike the previous installments in the series, Super Paper Mario abandons turn-based battles for quick-paced platforming combat. Also adverse to the norm, instead of just Mario there are four different playable characters, each collected in a different chapter and each with a slightly different moveset. The first obtained is Peach, who, like Mario, can jump around and has full use of the partner characters “Pixls” found chapter-by-chapter as obstacles arise, but in place of Mario’s special flipping ability, can use her parasol to float over large gaps, and can even duck down to use it as a shield. (Which is unbreakable by anything except for fire attacks.) A wide myriad of enemies as well as a fairly varied selection of platforming segments means you’ll be switching between characters often, as each is usually suited to a different style of play and combat. Mentioning Mario’s special ability again, a notable feature of this game is the power to flip from its usual strictly 2D perspective to a 3D plane resembling previous installments in the game. Only Mario has this ability, and it last for about ten seconds until it starts dealing damage to HP, so it’s mainly used for solving puzzles and bypassing obstacles. 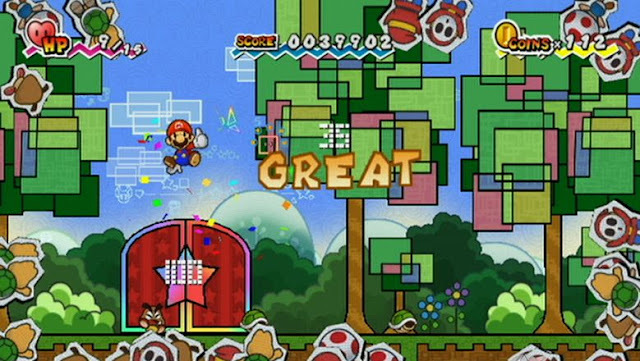 The vast majority of play is on the 2D plane besides this, though some battles tailored to use of Mario will require flipping between dimensions. While clever, the ease of this mechanic is pretty specific to what the game is asking you to do, as it’s a lot easier to jump on a solid enemy in a 3D plane than a flat one. As far as leveling and other RPG elements, this game uses a score-based system, which goes up as you take down enemies, execute combos, and use items. Each obtained level will increase different stats at different milestones, some resulting in a buff to HP and others a boost to base attack. That being said, level-grinding may sometimes be required depending on what you’re fighting, but unlike its predecessors, death in this game is more often going to be a result of low skill rather than low level. With practice, grinding is often not necessary unless you’ve spent a lot of time 3D-ing your way past enemies. 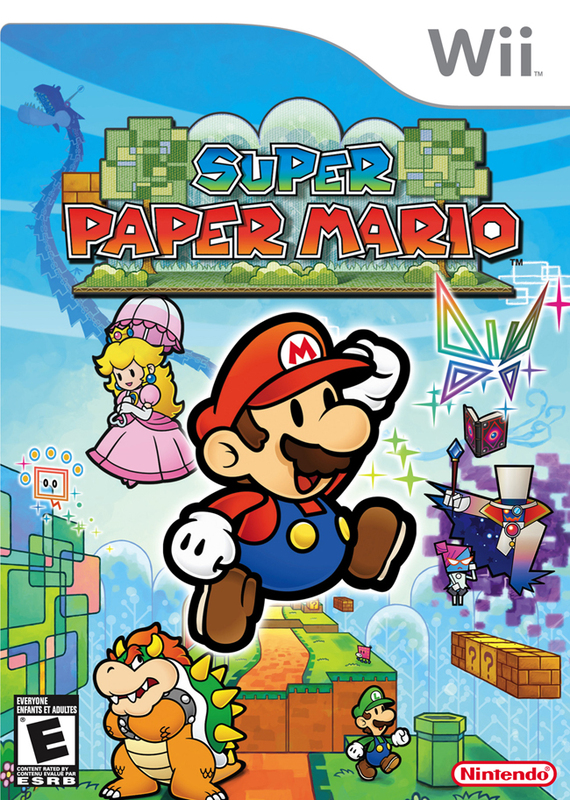 Overall this game has the usual brand of Paper Mario creativity and experimentalism, but cranked up to a towering degree and not always to stunning success. While the story is vivid and the characters charming, the heavy themes can offer kind of uncomfortable tonal shifts at times. Not to say that I didn’t greatly enjoy how far this game was willing to go, but it can be jarring to jump back and forth between mass genocide and fart jokes, if you catch my drift. Along with this, the pull back away from scene-like battles and enemy encounters broke some severance between fighting and adventuring, which I think detracts from the distinct feelings the worlds gave off in Thousand Year Door especially. On the gameplay side of things, the 2D platforming is solid but the 3D world is barren and can be difficult to move through. It’s really to this game’s benefit that the flipping segment is used in short bursts for puzzle solving primarily. On the positive side, this game is packed with inventive ideas and has a lot of confidence in them, which I can definitely respect. 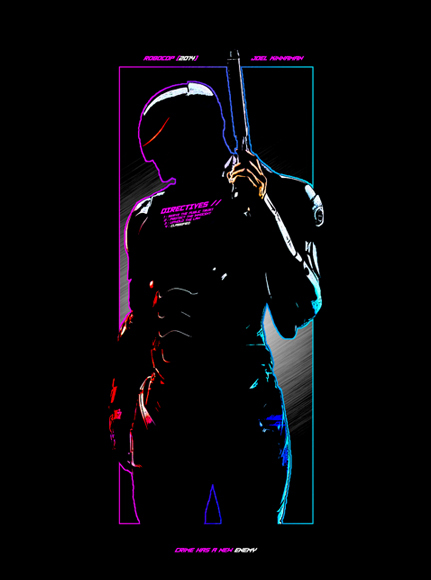 It’s hard not to enjoy playing as the vindictive waifu in a strawman jerk-nerd’s dating sim, or flying through space and shooting balls of lightning at a giant robot head. What the game lacks in expanded content that the previous title had in spades, it makes up for in the sheer absurdity of some of its level concepts. Not to mention that despite your Pixl partners being somewhat bland aside from their initial introductions, the addition of Peach, Bowser, and Luigi as playable characters and part of an interactive team is great, and gets a lot of good jokes (from Bowser especially). Also, the villains in this are fantastic, some of the best in this spinoff franchise. With tight gameplay and some truly emotional and dramatic storytelling, this game manages to cover its shortcomings pretty handily for an exciting, vibrant experience. As a long-time fan of the Paper Mario series, I was hesitant to pick up this title because of its emphasis on platforming instead of the turn-based system I enjoyed, but I once I gave it a try I was pleasantly surprised. It’s just as packed with wacky ideas and fun dialogue as the previous installments, but since this title is less text-heavy a lot of those concepts were instead used on gameplay elements and world/enemy designs. People that might enjoy this game are those that like the big, grand storylines that RPGs are known for but prefer fast-paced gameplay to the usual slow turn-by-turn progression standard for this genre. If you like platformers, this isn’t going to be the next Super Mario World by a long shot, but it presents some fun challenges, and most of the appeal is in the variance in mechanics rather than mastering a set of tight, simple ones. As for fans of the Paper Mario series, I say unless you are dead-set against 2D platforming gameplay, you’re missing out if you haven’t given this title a try.